We love our whisky, of this there is no doubt, but for some reason, whisky from our friendly neighbor to the north, i.e. Canadia, has rarely made an appearance during our research sessions. Thankfully, over the past couple of years, this situation has changed quite a bit. In addition to a Crown Royal expression or two, we have also had the opportunity to try some fantastic whiskies from Forty Creek, Still Waters Distillery, Corby Distilleries (their Lot 40 to be specific), and the ever present Whistle Pig (while this whisky may be “bottled in Vermont”, according to Davin de Kergommeaux of canadianwhisky.org, this 100% Rye whisky is actually made by Alberta Distillers), to name just a few. When the whisky from Canadia is that good, you can rest assured that it will always have a spot in our respective whisky cabinets. Never let it be said that we aren’t open minded when it comes to our whisky, and unlike Peggy Olson of Mad Men, we know that Canadian whisky isn’t JUST about rye. And now for a review of yet another Canadian whisky that found its way to our mailbox way back in June…. In 1939 the Royal Couple, King George VI and Queen Elizabeth, made history when they became the first reigning monarchs to journey across North America, traveling the vast distance by train. Upon hearing the historic news, a Canadian entrepreneur set out to craft a whisky suited for the pair. With perfection on his mind, he sampled over 600 blends and reviewed hundreds of different types of glass, labels and caps, before cloaking the final product in a purple bag to represent the purple robe of royalty and, fittingly, calling the whisky blend Crown Royal. The train carrying the couple was stocked with 10 cases of the exquisite blend. 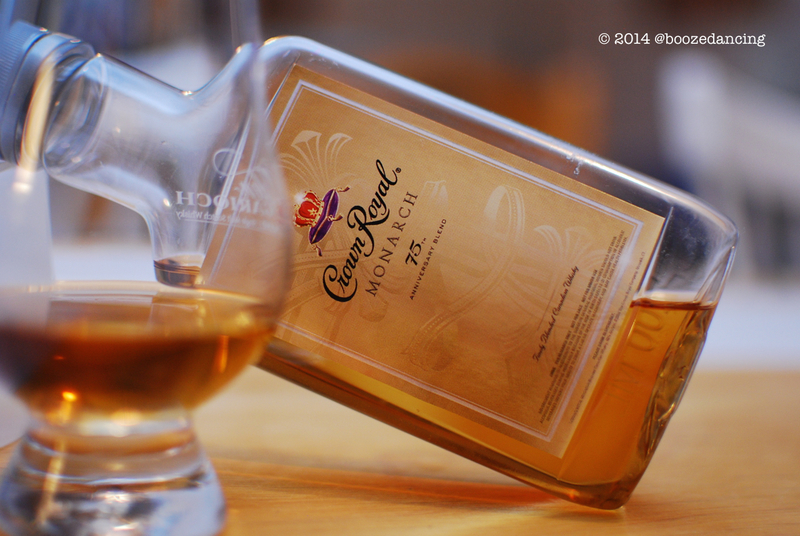 Rumors of the unrivaled Canadian Whisky quickly spread and Crown Royal was officially born. 75 years later, Master Blender Andrew MacKay has created an exceptionally smooth limited edition whisky to commemorate the brand’s monumental anniversary and celebrate the illustrious Crown Royal blending tradition. Crown Royal Monarch 75th Anniversary Blend combines hand-picked whiskies from the brand’s extensive stock, including a special whisky from the historic Coffey rye still, residing in Gimli, Manitoba Canada. Appearance: Somewhere between dark gold and pale amber. Limpd: I’m not sure if it is because I know that it is from our neighbors to the North, but I get a big hit of maple syrup, a sugary sweetness that is quickly followed by baking spices and a lingering aroma of cake icing. G-LO: Oodles of rye spice on this one. There’s a hint of maple sweetness, but it’s the spice that dominates, i.e. clove, allspice, cinnamon, and a bit of wintergreen mint. Limpd: There is some initial sweetness that is quickly replaced by a big hit of pepper that continues to build through the palate. The finish finds a return of the sweetness and a nice warm burn. G-LO: Medium mouthfeel with a hint of oiliness. Starts off lightly sweet with a maple or light brown sugar thing going on. A spicy tingle immediately follows with lots of cinnamon and cracked blacked pepper coming through. Mellows a bit as you approach the finish with the mild sweetness coming back. The flavors linger for about a minute with a hint of mint in the aftertaste. Limpd: I haven’t had all that much experience with Canadian whiskies. There is too much whiskey (a good thing) and too little time (a bad thing); so, I have spent a lot of focus on Scotch and Irish and lately a lot more Bourbon. The Monarch has made me rethink my strategy. There was a great deal of balance and character in this flavorful whiskey. I think I need to direct a little more attention to the Great White North. G-LO: I know I usually complain about whiskeys being too low in ABV, but for whatever reason, this time around, 40% ABV really works. This is a well balanced and easy drinking whisky with a mellow rye spiciness that I really enjoy. Definitely worth a try. Many thanks to the good people at Taylor Strategy for providing us with this very generous sample! To be honest, I haven’t had much Crown Royal over the years. I sampled this over vacation and really liked it. I think it’s worth a try. Thanks for the comment!